Many folks familiar with Southeast Asia perceive Pattaya as a city with a dirty beach on the Gulf of Thailand, streets lined with hookers, ready access to illegal drugs and frequent brushes with violence. Yet such a broad brush overlooks and, I think, overstates Pattaya’s proximity to Bangkok (a two-hour, $3 bus ride from the capital city), and its plentiful positive aspects. I have managed to sample only a few of them on two visits this year . In the first of two parts regarding whether moving to Bangkok from Phnom Penh was a good idea, I listed a number of pluses. After three and a half years living Phnom Penh, I have developed itchy feet, a symptom of which is my increasingly frequent travel to other countries. One country I have visited several times over the years is Thailand, next door, and I have much appreciated the contrasts between Bangkok’s, size, food and diversions to Phnom Penh’s. Smaller cities in Thailand have their winning characteristics, but I don’t find that they enjoy the same vitality or energy for me as the capital while they certainly provide significantly more opportunities for all that nature offers. I have been wondering whether we should make our home there. We still own almost nothing more than can fit in two large suitcases each, so it is no problem in that respect to pick up and go. 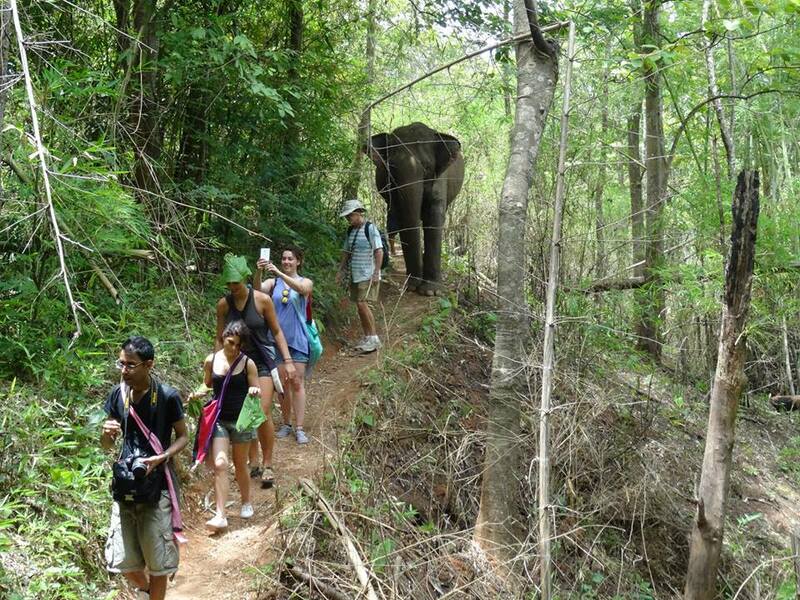 Okay, so the sixth in the group, plus the guide and two mahouts were there but clearly not in the photo. Neither is the second of the two elephants who strolled with us, busy foraging. With an extra day to spend in the northern Thailand city of Chang Mai last week, I explored some tourist sites in search of a diversion. And certainly I had one. I couldn’t have done better than my choice of the Elephant Nature Park charitable organization. Six of us had the pleasure of spending a day with elephants who essentially had been tortured in the past to carry passengers, lug logs or perform in circuses or venues such as zoos. Totally blind, she uses sounds and vibrations to navigate the area contentedly. Two or three among the 44 retired pachyderms who ramble in the woods and across the organization’s meadows, albeit in highly controlled conditions, are totally blind. 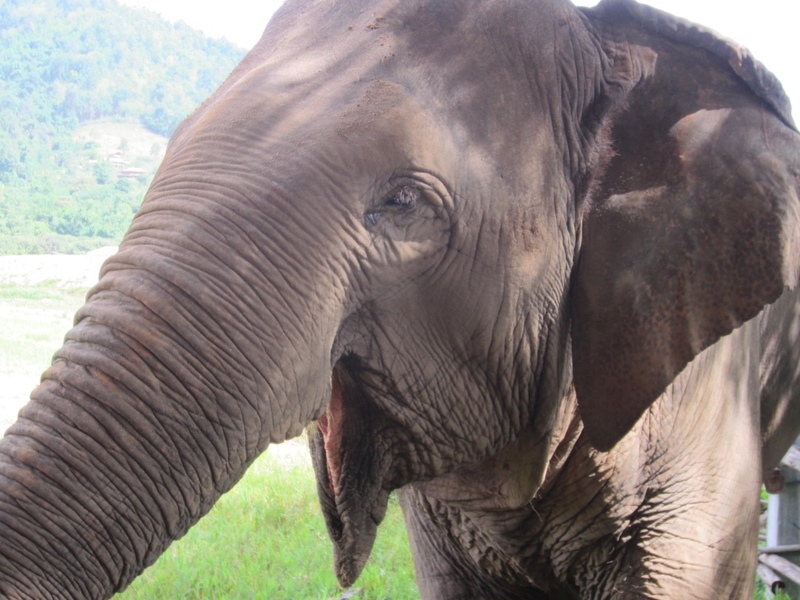 One lost her vision from being stabbed by an angry mahout (handler), and a second elephant had suffered too much time in the spotlights of a circus. I have acquired new contempt for rival facilities that offer rides to tourists or entertain them with tricks including having elephants create paintings. Fun for those who witness and ride, not so much for the abused noble creatures. On a day of announced protests last Sunday, police and soldiers mostly just hung around a busy intersection that is flanked by high-end malls. 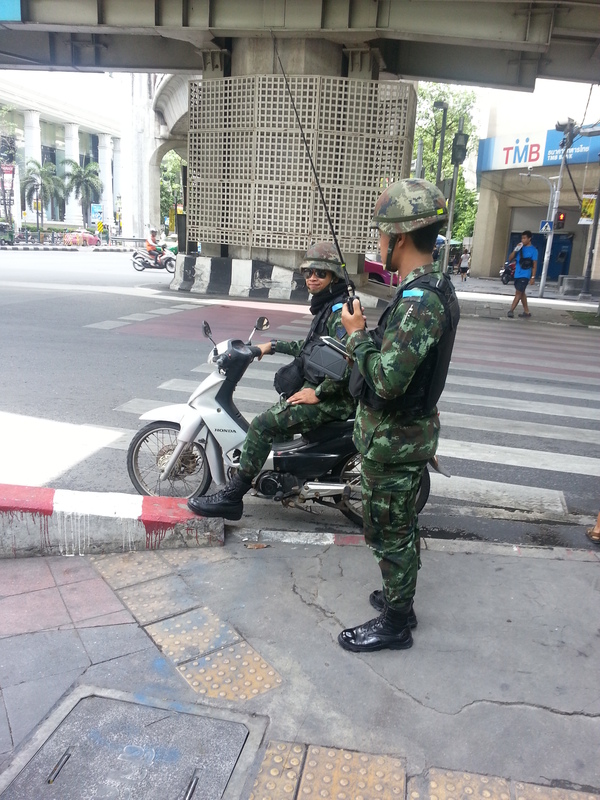 It was only on the day after our arrival in Thailand that we saw any soldiers — four of them routinely directing normally busy traffic. No one paid attention to them, and they were as casual and seemingly bored as supermarket cashiers. Click to see seated soldier’s smile. 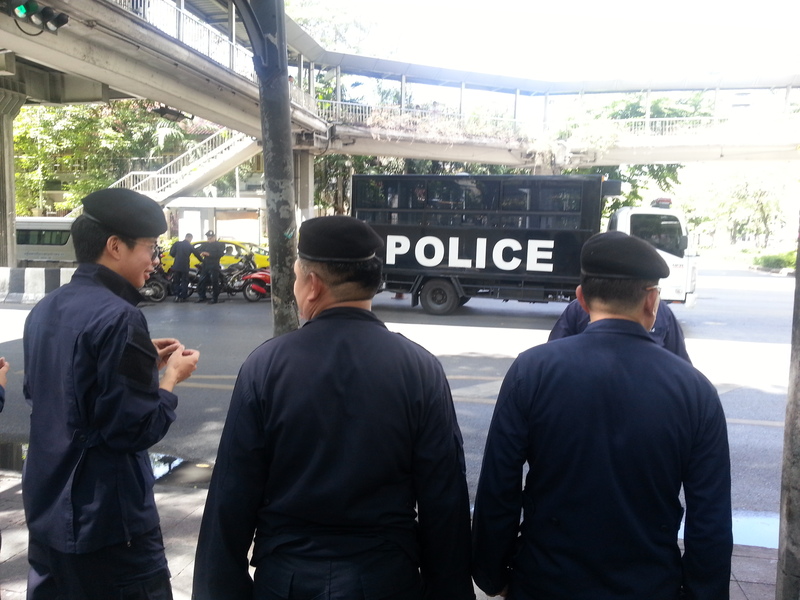 On Sunday, our fifth and final day in Bangkok, however, the announcement of protests scheduled for busy intersections and upscale malls, a few of which were closed, resulted in a show of force. By closing two Skytrain stations and gathering at intersections, the authorities kept protests to a minimum and hardly inconvenienced tourists, except those hoping to browse the shuttered malls.